In ancient Greek mythology, it is mentioned: Gaia [Mother Nature / Earth] is a mother and husband of Uranus [Father of the Sky] who gave birth to 12 (twelve) Main Titan, they are Oceanus, Coeus, Crius, Cronus (Kronos), Hyperion and Iapetus, Theia, Rhea, Themis, Mnemosyne, Phoebe and Tethys. The next generation of Gaia and Uranus after the 12 Titan is the Cyclopes: Brontes (Thunderer), Steropes (Lighting) and Arges (Bright), then Hecatonchires: Cottus, Briareos and Gyges, each of which has a hundred hands. Furthermore, Gaia gave birth to Erinyes, Gigantes and the Nymphs called Meliae; and from Testicles (testicles) Uranus, the fourth was born, Aphrodite. 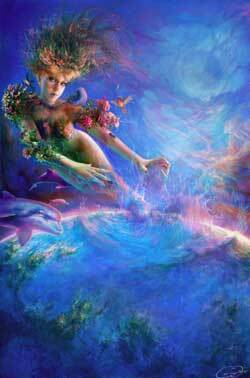 Oceanus was a Titan son of Gaia and Uranus, brother and husband of Tethys Titan, the father of all that exists in rivers and at sea in the world. Oceanus is sometimes portrayed as a serpent that surrounds the earth, its tail up in his mouth. Or as an old man with long beard with bull horns on his head. With the power of the Olympian gods, Poseidon became ruler of the sea and rivers while Oceanus retire and be forgotten, although his name is still used to indicate the broad waters stretching across the world. Also known as Pheus (one above), one of the Titan in Greek mythology, husband of the Titans Theia and the father of Helios (Sun), Selene (Moon) and Eos (Dawn). He is the master of light, and Titan which comes from the east. Hyperion is sometimes used as a name for the Sun itself. Coeus is the first generation Titan in Greek mythology, son of Uranus and Gaia, husband of the Titans Phoebe and father of Asteria and Leto. Leto then became the mother of Apollo and Artemis. Known for his role as a parent (the parent), as well as the god of intelligence and thought. Is a pillar of the sky around the constellations, and celestial guards prophecy (the keeper of the Heavenly Oracles). While best known for his roles as parents, Coeus is considered the god of intellect and thinking (the Titan of Intelligence). He also is a pillar of the sky around the constellation of stars that evolve and, thus, the keeper of the celestial prophecy. With his brothers, Coeus thrown by Zeus, the greatest of the Olympian gods to conquer, to Tartarus, the depths Underworld. Cronus or Kronos is the youngest and is the leader of the Titans first generation, direct descendants of Gaia (the earth) and Uranus (the sky). By Rhea (his sister and his wife), Cronus was the father of his daughter: Demeter, Hestia, and Hera and her son: Hades, Poseidon, and Zeus, who later would become gods in the Olympian / Olympus. Cronus seized the throne from his father Uranus, and this in turn seized the throne by his son, Zeus. Cronus is often depicted holding a scythe and identical with the Roman god, Saturn. Crius or Kreios is the first generation Titan, which equals the other is the son of Uranus and Gaia, husband of Eurybia (daughter of Gaia and Pontus relationship), and became the father of Astraeus, Pallas and Perses. He is a leader rather than domestic animals and is usually associated with a goat or ram. Some sources state that the Aries, the Ram is the star in the constellation of manifestations. Often called “Jepetus, he married Clymene, a daughter of his brother Oceanus, and became the father of four children, second-generation Titan: Atlas, Prometheus, Epimetheus, and a son more or less known, Menoetius. The Greeks considered Iapetus is the main ancestor of the human race because of his son, Prometheus, is the main supporter of mankind. When the Titans were defeated by the gods of Olympus, he was thrown into Tartarus, a world away from the world even more in his Hedes dead, then put the island on it so he would not flee. During the war between the Titans and the gods of Olympus, Tethys raised the goddess Hera as his adopted children. By several sources said was a mentor from the goddess Hera. Theia (Radiant) is a titan who gave a bright blue sky, the wife of Hyperion and mother of the giver of light in humans, Helios (Sun), Selene (Moon) and Eos (Dawn). Often also called the goddess of gems and gold, and has the ability to see the future. One of the titan who respected and temples made by people Thessaly. Pheobe was the daughter of Uranus and Gaia, from coeus wife and a mother of Leto and Asteria. Her name means light or shining. By some sources he was associated with the moon. By Leto, she was the grandmother of Artemis and Apollo. He received control of Themis the Oracle at Delphi. Rhea (Earth) was the wife of the Titan Cronus, who became the mother of the ruler of the gods of Olympus. His story is a rehash of the story his mother, Gaia. At one point his father, Uranus, jealous of the children of Gaia and then locked them inside the earth. But with the help of Gaia, her most daring, Cronus managed to defeat and drive out of Uranus. The story is similar Rhea, Cronus who became jealous of her children and then swallow them. Rhea managed to save Zeus, who then saved his brothers. Together they managed to defeat Cronus. Rhea is often identified with the Earth and is the goddess of fertility. His female followers are the largest in Crete (Crete), which is believed to be the birthplace of Zeus. Themis was the Titan who became one of the many lovers of Zeus. He is the mother of the Horae (Seasons), Moirae (Fate), Astraea, and (some say) Prometheus. Themis was the goddess of law and order, justice, kindness, and prophecies. According to legend, he is said to frequently communicate with the Oracle at Delphi before Delphi became the temple of the god Apollo loved. Themis predict future capability allows it to be one predictor of Delphi, which in turn cause the formation of himself as the goddess of justice.